THE DEXTER HOUSE The third bedroom at the Dexter House has been a huge question mark since the we moved in last September. At first, this room was left intentionally empty in order to set up a labor tub for Brooks' home birth. After our littlest was born, we started storing stuff in here, until so much stuff accumulated that I simply closed the door and ignored the room altogether (I know, I know, not a good strategy when space is tight!). But with the threat of house guests over Thanksgiving, we finally had no choice but to clear the clutter. So we cleaned the room up (threw stuff away or stored it in the basement), tossed a bed in here, and called it good...until now. Because the least we can do is have a guest bedroom that guests actually like to be in. At 8.5'x9', our guest bedroom is a cozy 77sf. Cozy as in realtor speak for tiny. But worse yet, the only window in this room is north-facing and not particularly large, meaning it's dark in here all day long. The only storage in the space is a two-foot wide closet in the corner. All in all, this room is a design headache and it's taken me a few months to wrap my mind around what we can possibly do to make it better. Like it usually does, inspiration struck like lighting last week. We were showing the Bryant House (our second house) to new tenants, and had one of those "ah ha" moments when I walked into the second bedroom. See, I actually love the second bedroom at the Bryant house. And it's tiny. Like 70sf tiny. But it's a great little room. And not because of great architectural bones or huge windows (it doesn't have either). It's lovely because it's cozy (cozy as in actually cozy). It has tall wainscot and hardwood floors, and the walls are painted a lovely shade of gray, which all enhances the comfort of the space. Basically, it's a great room despite being only 70sf. And I thought, hey we can do this! What do you think? Would you ever paint your walls black? We're on a tight, two-week turnaround before more guests arrive, so wish us luck! I'll give you an update later this week. p.s. 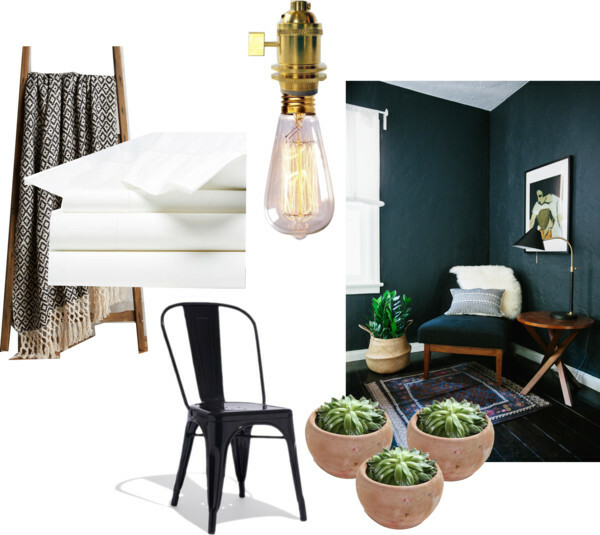 Emily Henderson's recommended colors for rooms like our guest bedroom (aka small and dark). p.p.s. I was really inspired by this dark teal bedroom. Don't you think the wall color just makes that room?! p.p.p.s. The secret to long lasting love from...celebrities?! Okay, so maybe not the most authoritative source, but it's a fun little read!